Glamorgan No 11 Michael Hogan says he was embarrassed to be top scorer as the team battle to avoid an innings defeat against Lancashire. 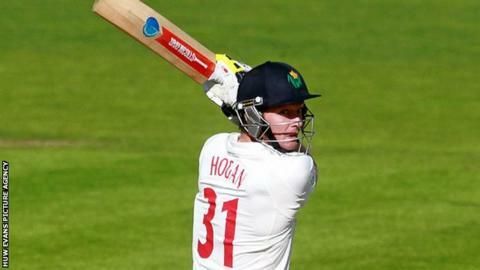 Hogan hit a career-best 57 as Glamorgan managed 348 in their first innings and watched as they were reduced to 146-5 in their second innings. The Australian believes the top order are failing to score enough runs. "We're shooting ourselves in the foot in the last month or so, it's something that needs to be addressed," he said. "It's happened a bit too much. It's happened again when we're five for 140-odd on a pretty decent wicket." "It's a little bit embarrassing to be honest with you, but it's nice to get a few runs I suppose." Lancashire's first inning total of 698-5 declared means Glamorgan are still 240 runs short of making them bat again, with the responsibility again falling on the bottom order. The Welsh county's lower half have scored more first-innings runs than the top order seven times in 10 championship matches this season. The last time a Glamorgan No11 top-scored in a Championship innings was in 1982, when Simon Daniels scored 73 against Gloucestershire at Swansea in a record last-wicket stand of 143 with Terry Davies. "You don't lose five wickets and think it's the end of the game," added Hogan. "Everyone is there to contribute so things need to be addressed but we are a team and we play as one." "It's not happening [for the top order] and a little bit low on confidence, they're trying hard and they'll try and rectify it for the next game but it's just a bit disappointing at the moment." Hogan struck five fours and three sixes in his knock of 57 off just 44 balls to maintain his position as one of the fastest scorers in Division Two of the Championship. "It's good fun ... normally I enjoy going out there and swinging hard, but I tried to concentrate a bit more even though I was better than a run a ball," he said. Paceman Kyle Jarvis and spinner Simon Kerrigan have claimed two wickets each in the Glamorgan second innings, with Chris Cooke unbeaten on 43 overnight. "There's still a chance of making them bat again as long as we apply ourselves and take pride in the way we approach it," said Hogan.